You may remember that the monster-themed anthology came out of a similar public event last year ("Why do we need monsters? "), so we have fond memories and high hopes for this evening! To celebrate the Ancient Magic event, which will include presentations as well as hands-on activities, and will be family-friendly, we are offering a free paperback copy of the Making Monsters anthology as a prize in the social media image contest. 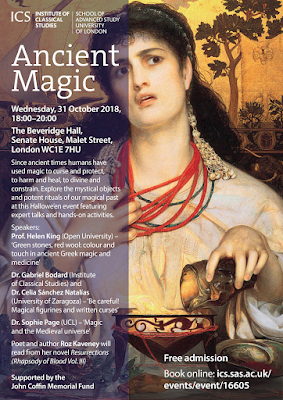 Simply post an image (it can be an archaeological object, ancient or modern artwork, painting, character, or your own work) that makes you think of ancient magic, with the hashtag #ICSmagic by midnight on Wednesday Oct 17th, and tell us why you like it, and we'll choose a winner right after that. There are some examples there already, if you're looking for ideas of the sort of thing that might work.